Wizzma’am is an indispensable tool for you to engage your classroom with daily creative activities. Wizzma’am is a card-flip perpetual calendar, designed for playschool/kindergarten teachers, printed with fun activities that you and your children can enjoy doing together. It has carefully designed activities that are sure to stimulate the young minds of your classroom/school. Now you don’t have to spend hours researching on what you can do to engage your classroom. Just pick the cards for the day and prepare yourselves for oodles of fun! Stimulate the minds of your little ones and engage them daily with fun and creative activities with the help of Wizzma’am! 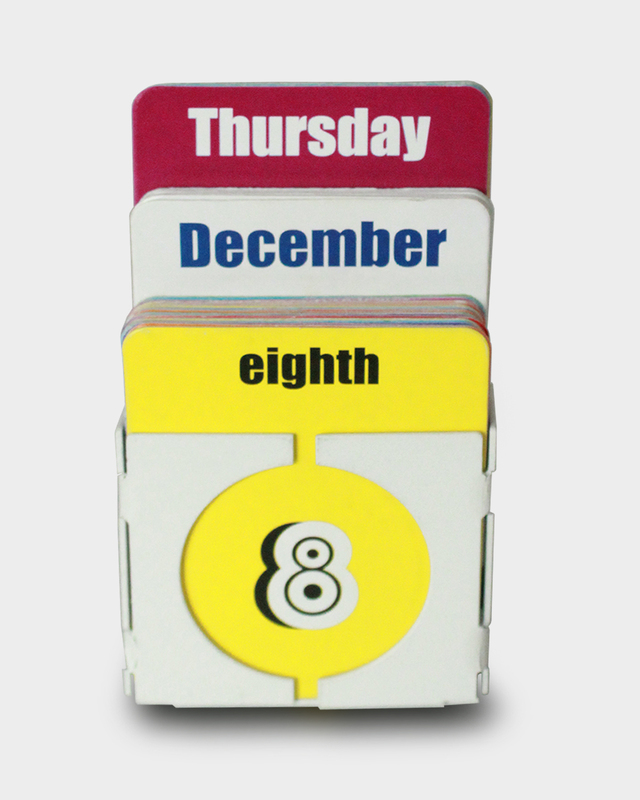 Wizzma’am is a card-flip perpetual calendar designed with kindergarten and playschool teachers in mind. 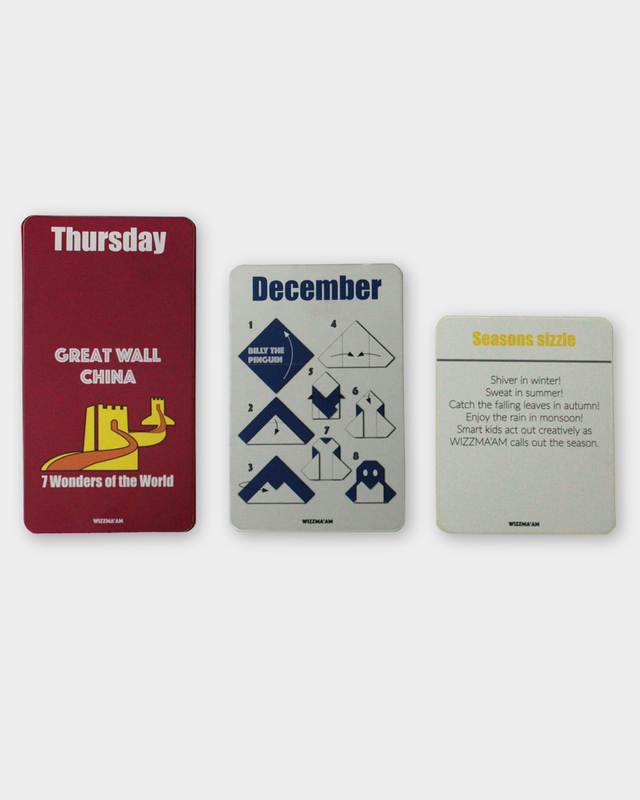 It comes with carefully designed activities on each card. Wizzma’am is bundle of well thought out creative activities (including simple origami model making, team activities that provide fun and learning, and wonders of the world) that are sure to provide your children their daily dose of creative nutrition. You don’t have to prepare in advance, nor spend hours on the internet to look for activities you can engage your classroom with. Wizzma’am helps you ensure your children are engaged in safe and productive activities with no shortage of entertainment and fun! 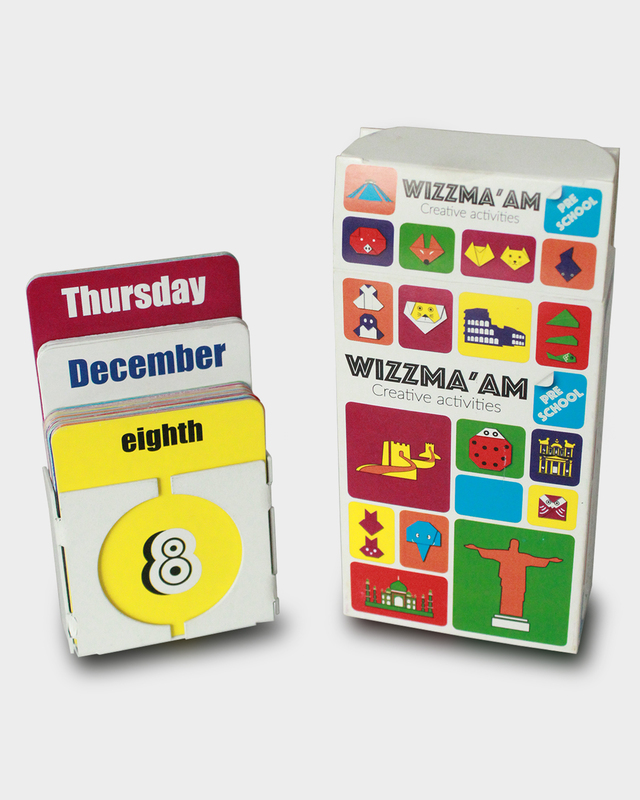 Each pack of Wizzma’am comes with a metal holder and 50 cards (12 for the months, 7 for the days and 31 for the dates), and the package itself, with its colourful images showing the various activities. Wizzma’am is made with powder coated steel and printed and die punched 300 GSM paper for the packaging and the cards.